We are grateful to Professor Ugo Ruggeri for confirming the attribution to Pietro Rotari on the basis of photographs. He notes that it is a 'bella e variata versione' of the picture depicting the same theme by Antonio Balestra (sold Christie's, London, 23 March, 1990, lot 13). 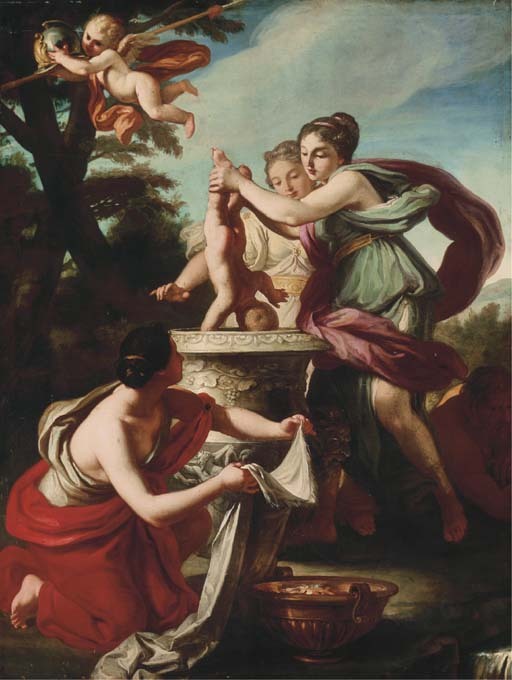 Rotari first studied in his native Verona with Balestra before departing for Rome and Naples in 1728, where he entered the studio of Francesco Trevisani and then that of Francesco Solimena. He returned to Verona in 1734 and opened a private academy. There, he concentrated on the production of historical and religious paintings that were to bring him international fame. In 1740, Rotari was awarded the title of Count of the Venetian Republic in recognition of his achievements. The following year he travelled to Vienna, where he met Jean-Etiénne Liotard whose work profoundly influenced him. Rotari was in Dresden in the service of Frederick Augustus III when he received the invitation of the Empress Elisabeth of Russia, daughter of Peter the Great to come to Saint Petersburg as Painter of the Court. He arrived in Russia in 1756, where he remained until his death, amassing a large fortune; indeed a visit to his richly appointed house on the Bolsciasia Morskaia became obligatory for high-ranking visitors to the city. Duke Joachim Ernst von Anhalt (1901-1947), from whom confiscated after 8 May 1945 and taken to the Staatlich Galerie Moritzburg Halle, Landesmuseum Sachsen-Anhalt, 1958-2003, inv. no. I/1770, whence restituted to the Ducal House of Anhalt, 2003. The Princely and Ducal family of Anhalt (the so-called Askanier) was among the oldest and most important of the former reigning families in Germany. From the early Middle Ages until 1918, the heads of different branches of the dynasty were the sovereigns of the Duchy of Anhalt, which had been reunited in 1863 and later became in part today's federal state of Sachsen-Anhalt. Over several centuries, they influenced the political, economic and cultural history of Germany, and indeed of Europe, but their influence is most apparent in Sachsen-Anhalt itself, and in the towns of Ballenstedt, Bernburg, Dessau, Köthen, Mosigkau, Wörlitz and Zerbst. After 1918, the Duchy retained considerable estates as well as a large part of the family collections they had assembled over the centuries - over 3,000 paintings alone were catalogued at the time. Besides these, the collections comprised prints, furniture, glass, porcelain, precious objects and works of art. The last reigning Duke and sole owner of the Askanian heritage, Duke Joachim Ernst von Anhalt (1901-1947) for the most part kept the vast and important art collections in the castles at Dessau and Ballenstedt, although many objects were lent to public museums, such as his own Joachim-Ernst-Foundation in Wörlitz. War losses, looting and the dispossession of the Duchy's assets in the Soviet occupied zone, which later became the German Democratic Republic, reduced and dispersed the collections considerably. However, the three children and heirs of the Duke have now returned to Ballenstedt, and the family's researches into the whereabouts of the collections has led to the identification and restitution of several works of art, amongst them the present picture. Following their long family tradition, the Ducal House is again active in the economic and cultural life of Sachsen-Anhalt. This activity will be supported and strengthened through this sale at auction.